Where will OWL be located ? How much will it cost ? When will it become operational ? How faint will it see ? How does OWL compare with space telescopes ? How is the optics made ? The same resolution as in space ? What is active optics ? What is a milliarc second resolution ? Why a lightweight design ? What is the benefit of larger telescopes ? Why not a classical optical design ? How are the segments kept aligned ? What's in a name ? Clear sky is not enough - the sites of modern observatories are chosen according to numerous criteria. The nest for OWL has not been selected yet and a world-wide search is under way, scrutinizing the many parameters relevant to the performance and cost of an Extremely Large Telescope (ELT): atmospheric properties (cloud cover, brightness, turbulence strength, speed and height distribution, water vapor content), geography (access and utilities cost, earthquakes, soil resistance), etc. Prominent candidates include areas close to ESO's observatories La Silla and Paranal, in the Chilean Atacama desert, as well as the site of the Roque de los Muchachos on the island of La Palma (Canary Islands). Other possible candidates are being evaluated too, including but not limited to sites in Argentina, the Atlas and even particularly performing -and demanding- locations near or at the South Pole. To the possible extent, site selection will also take into account potential long-term climate variability. The total estimated cost of OWL is about 1,200 millions of Euros, including 940 million Euros in capital investment. This figure is however provisional, as the conceptual design phase and relevant industrial studies are still in progress. At the time being, major cost positions (structural mechanics and optical subsystems) have already been addressed by way of competitive industrial studies. Because of its modular design the telescope could become operational before full completion. 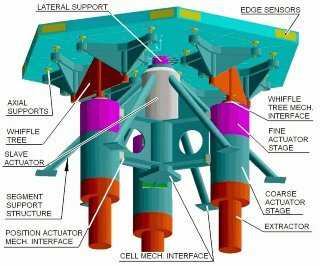 Once the telescope structure and the enclosure are completed and the essential control systems integrated, the telescope is basically "growing" at the pace of integration of the segments. The project is still in an early phase and at the time being funding is secured for studies only, not for construction. ESO is currently reviewing its options, with a view to identifying possible paths towards the final design and construction of a 60- to 100-m OWL. Taking into account plausible funding schemes as well as technical considerations, and making generous allocations for engineering work in the first phases of segments integration, OWL could start science operation as a 60-m class telescope by 2016-2017, with full 100-m capability by 2020. A faster schedule would be possible with early funding. The diameter of a telescope is its key performance characteristic. A larger telescope will collect more light, in proportion to its collecting area hence to the square of its diameter, and concentrate it in images whose sharpness (or resolution) is also proportional to the diameter. In brief, a telescope of 100-m will collect 100 times more light than a 10-m one, and have an angular resolution 10 times better. In practice, imperfect reflectivity or throughput of the optics will imply some losses of light, while atmospheric turbulence and residual telescope errors will limit the resolution. Still, the larger the better. HOW DOES OWL COMPARE WITH SPACE TELESCOPES ? In view of their cost and specific constraints, future space and ground observatories are likely to complement rather than compete. Observing from the ground imposes two main limitations. The first is the blurring effect of atmospheric turbulence, which degrades angular resolution much beyond the theoretical limit, even on the best astronomical sites. The second is the limited transparency and relatively high brightness of the atmosphere at certain wavelengths of light. The first limitation can be overcome with adaptive optics, a technique that allows real-time compensation of the blurring effect of the atmosphere. Indeed, the best astronomical images in terms of resolution are now taken from ground rather than from space, and all current and future telescope projects incorporate adaptive systems, which come at a tiny fraction of the cost of a space telescope. Still, the current generation of adaptive optics systems are limited to observations in the near-infrared, with a small field of view and constraints on target selection. A second, more powerful and versatile generation is under development, with first results expected by 2005. 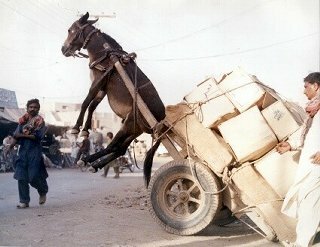 As for the second limitation, there does not seem to be any physical way to overcome it. As a result, space telescopes are a must at those wavelengths where the atmosphere isn't dark or transparent enough, e.g. in the X-ray and far-infrared domains. In the visible to near-infrared, a large space observatory like the 6.5 m diameter JWST, unhindered by the absorption and emissivity of the atmosphere, will have a superior ability to detect new classes of astrophysical objects, while a 100-m diameter OWL, with its much larger light collecting power and at a significantly lower global cost, will provide deep physical identification through spectral analysis. HOW CAN OWL ACHIEVE THE SAME RESOLUTION AS IF IT WERE IN SPACE ? The light waves collected by ground-based telescopes are inevitably distorted by atmospheric turbulence, thus preventing these telescopes to reach their theoretical resolution, no matter what their intrinsic quality is. Schematic principle of adaptive optics. The distorted wave is shown after propagation through the atmosphere and the telescope. The theoretical resolution is best expressed as the sharpest angle beyond which a telescope will no longer be able to deliver a meaningful image contrast, and is given in radians by the ratio l/D, with l the wavelength of light and D the telescope diameter. Hence an 8-m telescope should be able to resolve objects down to 0.013 arc seconds at visible wavelength (l=0.0005 mm). Yet because of atmospheric turbulence, images taken from good astronomical sites have a typical resolution of 0.5 to 1.0 arc seconds, occasionally better when the conditions are optimal. The most evident solution to this problem is to place the telescope in orbit. This is, however, a very expensive one, and it has its own drawbacks - such as reduced lifetime, difficult or impossible maintenance and upgrades, etc. Another is to fit the ground-based telescope with an adaptive optics system. 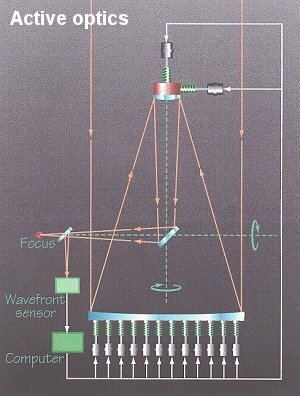 It essentially consists of one or several active components (deformable mirror), a metrology system (wavefront sensor) and a fast computer. The metrology system picks up the light of a reference star in the field, and measures the distortions of the incoming wave. This measurement is translated into commands sent by the computer to actuators supporting the deformable mirror, whose shape is eventually adjusted so as to compensate the distortions of the wave. This correction must be repeated continuously -in practice hundredth of times per second, turbulence being rapidly changing. As a result, the blurring effect of the atmosphere is cancelled out -at a tiny fraction of the cost of a space telescope. This technique has been successfully integrated into quite a number of existing ground-based telescopes, allowing them to deliver unrivalled images. Yet it still has crucial limitations. Turbulence changes with direction, hence images can be corrected over a rather small field of view only; a reference star must be found close enough to the science target, and must be bright enough to allow its light to be collected and analyzed within a few milliseconds. Second generation adaptive systems, with enhanced capabilities, are under construction and should enter in operation on 8-m class telescopes within the next years. WHAT IS A MILLI-ARC SECOND RESOLUTION ? Rigorously speaking, the term "resolution" is related to the ability of an optical system to render contrast in the image of complex objects. In astronomy, it is also often used to characterize the sharpest angle under which two point-like sources will still be separated into individual ones. A milli-arc second is the angle under which two sources separated by one meter would be seen, if placed at a distance of about 200,000 km from the observer. The theoretical resolution of a telescope is given in radians by the ratio l/D, with l the wavelength of light and D the telescope diameter. With visible light (l~0.0005 mm) a 100-m telescope should be able to reach a resolution of 0.000000005 radians, i.e. 0.00000028 degrees or 1/1000th of an arc second. HOW FAINT WILL IT SEE ? OWL will be able to reach magnitude 38 in 10 hours exposure time. This is a factor five thousand billion (5,000,000,000,000) fainter than the faintest star visible to the naked eye. The primary and secondary mirrors will be made of hexagonal segments, 1.6-m flat-to-flat (diameter of the inscribed circle). The primary mirror is spherical, made of 3042 all-identical segments. The secondary mirror is flat, with 216 all-identical segments. The segments will be made of low-expansion glass or glass-ceramic. Lightweight silicon carbide is considered as a promising alternative, and a development programme is under way to validate the technology. The segments will be polished on conventional lapping machines, their simple spherical or flat figure allowing cost- and quality-effective processes. The required production rate is about 1.5 segments per day. Although impressive by the standards of astronomical production, this high rate is within reach of properly industrialized production. Because of the simple, all-identical spherical or flat figure and of the relatively modest dimensions of individual segments, the process yield and the necessary investments are reliably predictable. This has been confirmed by European suppliers under ESO contract. WHY NOT A CLASSICAL OPTICAL DESIGN ? The telescope length, hence the primary mirror focal ratio, must be minimized to allow reasonable stiffness and keep enclosure dimensions to the minimum required. The field and optical quality requirements call for proper correction of aberrations in the 10 arc minutes field of view. The design must incorporate suitably located optical surfaces to perform the required functions (active optics, field stabilization, adaptive optics). Large deflections under gravity and wind load are inevitable in viiew of the structure size and therefore, designs sensitive to misalignments should be avoided, or at least cirtical surfaces placed at locations where high structural stiffness can be realized. Cost, which, in addition to other system considerations, restricts the shape of the primary mirror to that permitted by a cost-effective fabrication process. These constrains virtually rule out classical two-mirrors solutions and alternatives must be explored. Solutions with spherical primary and secondary mirrors become particularly attractive in view of the manufacturing, maintenance and cost benefits of all-identical segments. Individual segments are permanently re-adjusted in position. Segments must be aligned to within a fraction of the wavelength (0.0005 mm for visible light) in order for the telescope to deliver acceptably good images. Such tolerance cannot be met passively and the segments must be permanently re-adjusted in position, up to a few times per second to cope with e.g. mounting imperfections, flexures, thermal changes, wind buffeting. To this end, the segments are mounted onto a support system that distributes their weight onto an even distribution of supports. Those are connected to three position actuators that allow re-positioning of the segment down to a few nanometre accuracy. Minute misalignments are measured by position or edge sensors (e.g. capacitive, inductance-based or optical) located between segments; the measurements are fed back into a computer that calculates the necessary re-adjustments and sends appropriate commands to the actuators. The sensors must be periodically calibrated; this is done with a phasing sensor located at the focus of the telescope, and which uses the light of a star outside the science field to produce an image of the segmented mirror in order to detect, in one way or another, diffraction effects associated with segments local misalignments. There are several possible types of phasing sensors. That used in the Keck telescopes should theoretically work with up to ~4000 segments; others (curvature, pyramid, and Mach-Zehnder sensors) have been shown to work in laboratory experiments and are being developed for on-sky testing. Modern telescopes are re-optimized in real time during operation. Active optics, pioneered by ESO in the mid-1980s with its 3.5-m New Technology Telescope (NTT), is a concept that allows the actual quality of a telescope to be re-optimized in real time. In the NTT, the secondary mirror is supported by a kinematic mount that allows to center it and focus the telescope as needed. In addition, the primary mirror is mounted on force actuators (which could be conceived as motor-driven "springs") in order to adjust its shape by applying suitable force distributions. Doing so not only allows the optical quality to be kept optimal, it also allows -even require- the primary mirror to be flexible -hence thin, easier to cast and less expensive. It also simplifies the work of the optical manufacturer, as fabrication tolerances are greatly relaxed, residual errors being automatically compensated by appropriate adjustments of support forces. The primary mirror support correction forces and secondary mirror motion are calculated on the basis of measurements provided by a wavefront sensor located at the focus of the telescope. This sensor picks up the light of a star outside the science target, so as not to disturb the observation, the image of this star is analyzed and appropriate commands sent to the secondary mirror kinematics and primary mirror active supports. Active optics has shown its excellent potential and robustness in the NTT and more recently in the 8-m VLT telescopes, which routinely deliver images truly limited by the site turbulence. It may seem far fetched to call a 14,800 metric tons moving structure a lightweight one. Yet with 1/50th to 1/100th the mass of current 8-m telescopes if they were scaled to 100-m dimensions, OWL is a very lightweight design indeed. Yet its stiffness, as measured by its first eigenfrequency (2.6 Hz) is comparable to that of existing 4-m class telescopes. Mass saving is not only a matter of lower material costs. It has positive impacts at almost every level of the system design, in terms of performance, safety and costs. Eliminating unnecessary structural masses reduces flexures and stresses, implies less powerful drives, relaxes requirements for the concrete foundations, reduces transient thermal distortions, and simplifies integration.